The head of Taiwan's ruling party has arrived in China for a six-day visit that is being seen as another sign of warming ties between the two sides. During his visit, Kuomintang (Nationalist Party) Chairman Wu Poh-hsiung will meet top leaders and discuss cross-strait transport links. 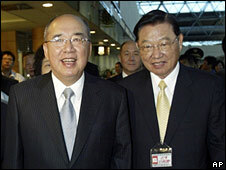 He is the first leader of a Taiwanese governing party to visit China since the two sides split in 1949. His visit comes days after Ma Ying-jeou was sworn in as Taiwan's new president. Mr Ma wants better ties with China and has called for a "new chapter of peace" to be opened. His predecessor, Chen Shui-bian, had angered China with moves towards formal independence, and relations had been severely strained. As he left Taiwan, Mr Wu said his 16-member delegation bore a great responsibility. "I hope the visit will help develop positive cross-strait ties, ensure security of Taiwan people, maintain welfare of Taiwan people and push for the government's China policy," he said. Mr Wu will meet Chinese President Hu Jintao on Wednesday. The two men are expected to discuss establishing direct cross-strait flights and allowing more Chinese tourists into Taiwan. But, says the BBC's Caroline Gluck in Taipei, Mr Wu is not authorised to sign any documents with Chinese officials. And some analysts have said that China is calling the shots by allowing this high profile meeting to take place before a visit by the head of Taiwan's semi-official body, the Straits Exchange Foundation. It is the only organisation designated by Taipei to hold negotiations with Beijing in the absence of official contacts. Nevertheless Mr Ma has said he welcomes this latest visit, our correspondent adds. He says contacts between the two sides' ruling parties could serve as what he called a "second track" in helping to improve and promote friendlier relations between Taiwan and China. China says that Taiwan is part of its territory, although the two have been separately governed since 1949.